Heart Mountain baseball team photograph. 1944 All-Star team from Heart Mountain which played a visiting team from Gila River. Most of the players are wearing uniforms from local teams they played for before the war. Front row (left to right): Snooks Kaoota, Take Ikeda, Yuzo Yasuhara, John Santo, Russ Hinaga, Mori Shimada, Chesty Okagaki, Fuzzy Shimada (went on to become a professional bowler after the war). Back row: Tosh Asano, Texie Watanabe, Min Horino, Babe Nomura, Fumio Kusunoki, Norman Yasui, George Ishitani, Chiakizuki, Bill Shundo, Rosie Matsui (coach). The All-Star team from Heart Mountain played a visiting All Star team from Gila River in 1944. Most of the players are wearing uniforms from local teams they played for before the war. Heart Mountain All Stars won three games to two over Gila River All Stars. But Gila River won all of the other games. All the games were at Heart Mountain. Front row (left to right): Snooks Kaoota, Take Ikeda, Yuzo Yasuhara, John Santo, Russ Hinaga, Mori Shimada, Chesty Okagaki, Fuzzy Shimada (went on to become a professional bowler after the war). 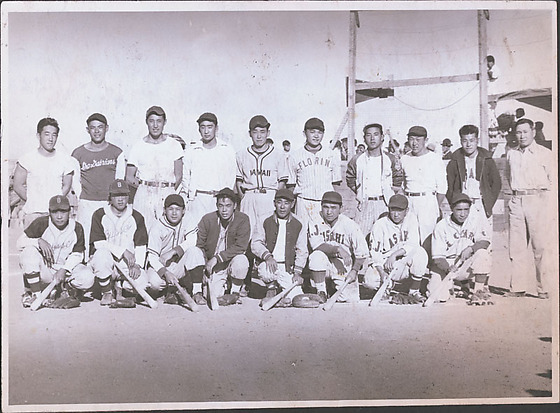 Back row: Tosh Asano, Texie Watanabe, Min Horino, Babe Nomura, Fumio Kusunoki, Norman Yasui, George Ishitani, Chiakizuki, Bill Shundo, Rosie Matsui (coach).